At the core of AlayaCare’s Community is the ability for customers, partners and employees to collaborate and share information. To get you started we’ve answered some of the questions we hear most often. If you think of any others, please don’t hesitate to contact us. AlayaCare is a provider of revolutionary cloud-based home healthcare software. What can you do with AlayaCare? With an end-to-end solution spanning clinical documentation, billing & payroll, scheduling, client and family portals, remote monitoring and mobile care worker functionality – we offer a platform for agencies to propel towards innovation and home care of the future. What markets does AlayaCare serve? At AlayaCare we take information security very seriously. In addition to following all the encryption and anonymization recommendations in the HIPAA law, we enforce a strict separation of clinical patient data from patient demographic data and the rest of our back office systems, essentially putting in place multiple layers of security and redundancy. Do I need to be a large agency to take advantage of AlayaCare? No - While AlayaCare is designed to support enterprise-level clients, our solution can be utilized by agencies of any size. How is AlayaCare different from other solutions? AlayaCare is a progressive software company with a mission to deliver better health outcomes. We recognize that technology, user experience, and data are pivotal in achieving our mission. 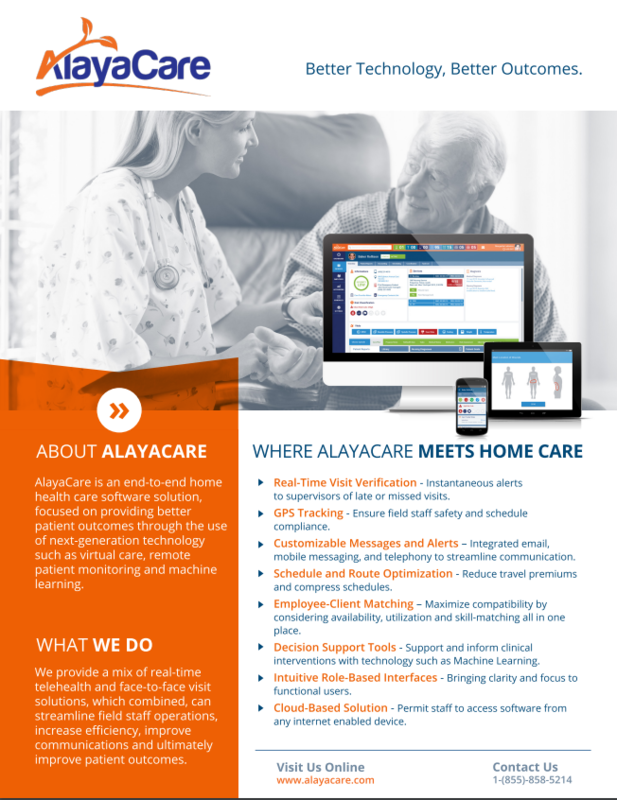 Over time, AlayaCare’s goal is to transform the way home care is delivered through next-generation technologies that allow the integration of Remote Patient Monitoring and Telehealth with traditional face-to-face in-home care, making it the most unique software vendor in the home care space. AlayaCare's pricing is structured as a subscription fee. The cost will vary based on the modules you implement, as well as the number of users. If you're interested in more specific pricing, we’d love to connect you with one of our client representatives who can assess your specific needs and provide you with a quote. In this brochure, you will learn more about our end-to-end home health care software solution that is focused on providing better patient outcomes through the use of next generation technology. You will also learn more about our various solutions and the features and benefits they provide.